Any new or used music, movie, game, or accessory. Purchase new releases or any of our used product that’s guaranteed to be in good working condition. Your music, movies, games or accessories for instant cash. 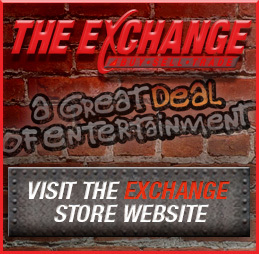 "Exchange” your used entertainment properties for even more value in store credit towards brand new games, music, videos or accessories or all of our guaranteed pre-owned titles. You can also receive trade credit in the form of a trade credit card. For the best value, trade frequently and “Exchange” your old stuff for new stuff at the higher trade value. You can take home movies and games and bring them back whenever you want for a trade value up to 75% of what you paid. It’s better than the video store or and better than home delivery – because it’s more convenient for you and we have everything you want under one roof – new and used – movies, music, games and more. A Great Deal of Entertainment! Trade whatever you want, whenever you want at The Exchange near you.